Maison Martin Margiela has launched Mutiny, a new fragrance for women. Mutiny is the debut fragrance from the brand under the creative direction of John Galliano, and is fronted by Willow Smith, Teddy Quinlivan, Hanne Gaby Odiele, Sasha Lane, Princess Nokia and Molly Bair. Mutiny stands against conformity and for new self-expressions, defying archaic ideas of identity, deconstructing normative values. It is a symbol of courage in the revelation of our true identitity. A manifesto to diversity. Mutiny was developed by perfumer Dominique Ropion. Additional notes include orange and jasmine. 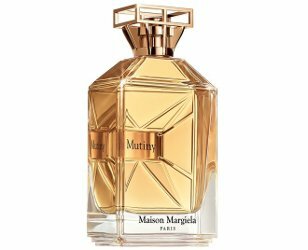 Maison Martin Margiela Mutiny is available now at Barneys, in 50 ($115) and 100 ($165) ml. Update: additional notes for the floral leather fragrance include mandarin and pink pepper. They are really trying to hard… does a fragrance really need to senda strong message? Shouldn’t the smell be enough? I wonder if anyone will smell it and think “wow, now this is defying archaic ideas of identity, deconstructing normative values”. Probably not. At the end of the day this brand (owned by Diesel) is trying to cash in on it’s fragrance license with L’Oreal, by creating a product from a man (Galliano) who was fired for making racist / anti-semetic comments in public. However, nice to see them breaking away from the Untitled / Replica series, which never really caught my eye. This bottle is pretty and the notes sound good. I thought the same when reading the llloooooooonngg list of names: trying too hard. ???????? I think perfumistas mostly think backstory isn’t so important, brands mostly think it is. I don’t know which is right, but perfumistas are already interested, so they’re not a typical consumer audience. I do love this name, surprised it hasn’t been used. As soon as I saw it was shocked to realize that it’s an incredibly good name that’s never been used before (as far as I know). I sort of doubt the scent can live up to it, but I guess you never know until you try it. I also thought the same thing. Well said. However, cynical I may feel, I do enjoy backstories (often over the top, but they can be fun and can pique my interest to at least read more about the fragrance) and it does have a great name. Not my favorite notes, but could be interesting. The bottle, cap included, is pretty much a replica of the bottles used by Tory Burch. Agreed on the name, Robin. But that’s not enough for me to seek this out. The brand doesn’t appeal to me at all. The frontal view of the bottle didn’t make me think of TB, but you’re right about the cap in this view. This immediately had me thinking of the book “Commodify Your Dissent.” “Be a rebel; buy our product.” Right. Yeah. It’s big now — Girls Can Do, etc etc. My first thought was actually: Scurvy accord with animalic notes of Norwegian rat, hardtack, and sea salt. Now that I would be interested in! These days the more unusual a perfume claims to be, the more I assume it will smell exactly like everything else. I am loving the bottle. I am glad this is created just for women, I am sick of perfume houses making the unisex crap. I really like Untitled EDP. The look is a little much (maybe fancy stopper OR fancy bottle, not both) and yes, the backstory is whatever, but Ropion + ingredients = must try.